Gina's fiancé, Matt contacted us about designing a comet-inspired engagement ring that was a mix of antique/modern. We spent quite a bit of time sketching designs and narrowed it down to a few and showed them to Matt. Originally he thought he wanted an asymmetrical design, but once he saw the symmetrical version we came up with, he decided to go with it. 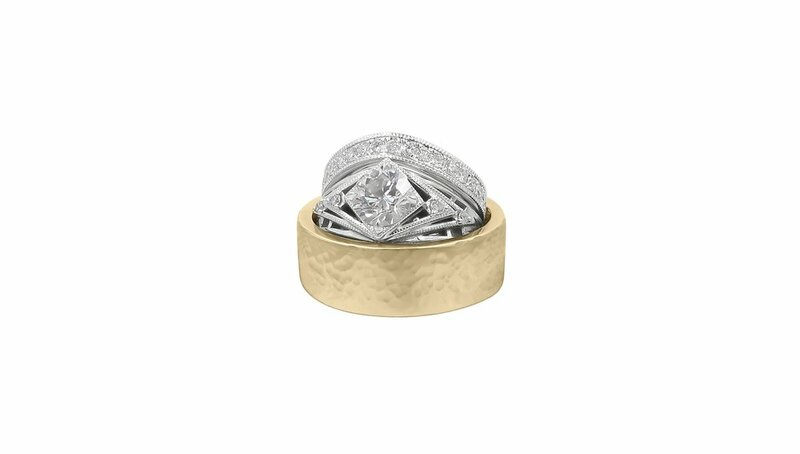 This ring is highly detailed-plenty of open spaces, has milgrain to add the vintage vibe, and a gorgeous 1+ carat center diamond set in a spectacular claw setting. Engagement ring paired with wedding band just before the diamonds were set. Engagement and wedding ring with diamonds completed alongside Matt's 18k white gold flat hammered band with satin finish.